Lest we forget the orchestral works of Stravinsky in his French period along with works by Milhaud and Poulenc have a certain unmistakably communicative Modernism and a joie de vivre that in the right performances seem as fresh and current as baked bread just out of the oven. The RTE National Symphony Orchestra under conductor Jean-Luc Tingaud give to us a very animated and enthusiastic reading of three such gems by Francis Poulenc, namely Les Biches--Suite, Les Animaux modeles--Suite and Sinfonietta (Naxos 8.573739). You know you are in for some detailed and dramatic readings from the first strains of the "Rondean" movement of the Suite from "Les Biches." And you recognize immediately from the presence of the performances how much the works demand a sympathetic vision to bring them fully to life. And this program has all of that in abundance. If I might interject an experiential note at this point which might help explain my attitude toward the performances of these compositions, I will now do that. In my own life I had a phase in my listening and appreciation that led me one-by-one to listen heavily to Modernists that had as one of the bases to paint sequentially scenarios through orchestration and tonality. It is clear that the 20th century ballet as a form had much to do with the music as it was structured in a story line. So Stravinsky's Petrushka, Firebird, Rites so much told Modern-leaning tonal stories that were such an influential basis for the pre-radical-avant scene. So then we had also some of Debussy's works, Milhaud's Le Creation du Monde, Honegger's Pacifica, Copland's Appalachian Spring, Kodaly's Hary Janos and on and on. Then of course we contemplate here Poulenc's Les Biches and Les Animaux modeles. My point is to say that there was a time when I immersed myself deeply in these works. That exposure in turn influenced me about thinking about orchestral Modernism, and one should not forget another extreme side of the programmatic descriptive, Richard Strauss Hero's Life, etc. At some point I discovered the more absolute music sides of Modernism and dwelled there for a rather long time. So Webern, Berg (though the Violin Concerto and Wozzeck are surely descriptive as well as abstract), Schoenberg (he belongs in both camps), Varese, Stockhausen, Boulez and a certain side of Messiaen, Penderecki, Xenakis, Carter, etc., preoccupied much of my attention, at that time more so than the descriptive Modernists who I had for a time grown tired of. And now each of the classic descriptivist compositions more or less I have been reawakened to again by vibrant new readings of the scores. And at the same time the Modernist absolutists I more firmly connect in my mind with Bach and no longer see as periodically modern tabula rasa. I bring this up because maybe such cycles of appreciation are not entirely alien to others, that my experience is shared by others on the quest to understand all in our time as well as the past? ? And in this view the very vibrant readings of the Poulenc Ballet Suites are most timely for me and inevitable maybe, inevitable for the need to regenerate some past loves as described above? In this view and bounding back and forth between absolute or semi-abstraction and literary descriptive styles may characterize a wholistic pattern of listening to modern music but also to music within history in general and to compositional trends as well, as they play out recurrently as perhaps bouncing between opposite poles, today of course as well as in past sequences? And all of that situates this particular recording in my own listening cycles. 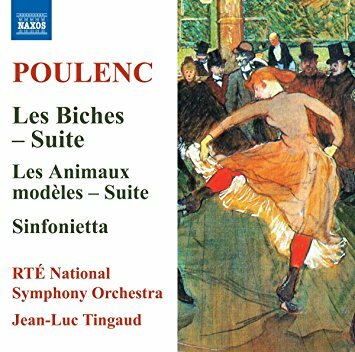 The end point is that this fine program is a good one to remind you of how essential the most essential Poulenc can be, as heard by these lovingly attentive renditions. OK, you might say, but two of the works come to us in the Suite form, and "Les Animaux modeles" is missing some of the suite movements at that. So what? This disk goes over some high ground without trying to be complete, and the ground it does cover it does very profoundly, I guess you could say. So the release seems both timely and necessary to me. But as for what it could be for you, I think it exemplary as a either an introduction or reaffirmation to Poulenc the orchestralist. So this one comes to you very highly recommended.